Wade Wilson a.k.a "Deadpool" is the anti-hero we have all been waiting to see again and Deadpool 2 sure did live up to the hype. Cast: Ryan Reynolds, Josh Brolin, Morena Baccarin, Zazie Beetz, Brianna Hildebrand, Julian Dennison, Stefan Kapicic, Karan Soni. Pros: The jokes and the jabs ranging from fellow Marvel heroes and movies to references of our everyday lives, to sci-fi and Star Wars, made Deadpool 2 even funnier than the first installment. The movie as a whole goes in a different direction and adds more drama which I won't spoil but I personally enjoyed it going that way. Cabel (Josh Brolin) was a great addition to this world and it's actually funny that Deadpool calls him out by another Marvel name which I'm sure you ALL know. The X-Force, that is all. One particular power that would be cool to have is Domino's, the power of good luck and seeing it work on screen made it that much cooler and yet scary if the wrong person had such an ability. It probably would have helped against the fight against Thanos am I right? 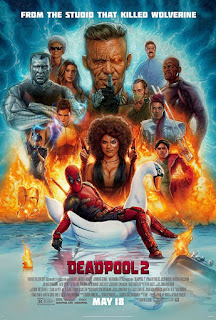 Cons: Some characters that were in the trailers weren't seen much in the film and Deadpool 2 only really focused on some of the main cast, including past characters from the first film. I wish they had made a little more time with the new people to get to know their powers and traits. One particular newcomer, in particular, wasn't that great but knowing he was a big part of Deadpool's journey to being a better hero made me tolerate him at least a little. Still, I thought some of his lines were boring and annoying as a whole. I haven't had a good laugh in such a long time and Deadpool 2 had me in tears. Definitely worth the watch and there is a particular scene towards the end that had me really wiping my eyes from crying out of laughter, so good luck holding it in because the whole theatre lost it too. Also, stay during the credits for a couple scenes! There is nothing after the credits.